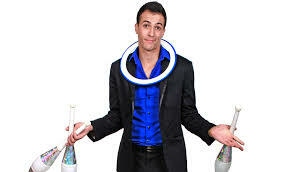 Juggler in Orlando, FL Florida - David Ferman "Catch the Comedy"
DAVID FERMAN "CATCH THE COMEDY"
As seen on ABC's Good Morning America, David Ferman is one of the rising stars of the juggling world. David's show "Catch the Comedy," combines world class juggling skills with hilarious comedy, high energy, and dangerous stunts. During the show you might see him juggling razor sharp machetes on a tall unicycle, eating marshmallows volunteers holds as he walks over them on his hands, or catching a glass bottle on a stick held between his teeth. In addition, David not only is a three time world champion juggler but he is also a world record holder.